Using an implant to replace a single missing tooth prevents having to alter the surrounding teeth, as with bridges. In the overwhelming majority of cases, a dental implant to replace a lost tooth is by far the best long-term solution for maintaining a healthy mouth. Dental bridges are an alternative treatment option, however the adjacent teeth must be cut down in order to support the bridge. Also, because they rarely need to be replaced, in the long run implants are more economical than dental bridges. 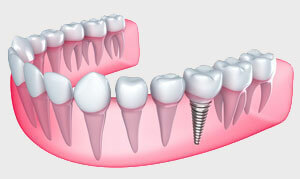 An implant is the best long term solution for replacing a single missing tooth. When teeth are missing from the jawbone, the jawbone loses the stimulus created by the constant chewing pressure and bone loss occurs. 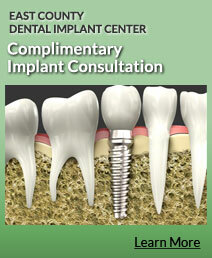 With a single-tooth implant the healthy teeth are preserved and bone loss is prevented. Implants also offer a more aesthetic appearance than a bridge and are easier to keep clean and bacteria-free. Additionally, gums can recede around a bridge revealing its metal base, while the bone loss under the bridge can cause a gap and an unattractive smile. 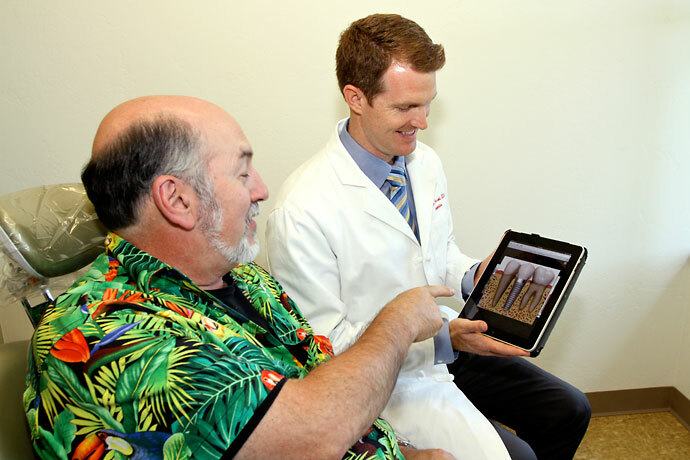 At Rancho San Diego Dental getting a single implant placed is a quick, minimally-invasive procedure, which can be completed under local anesthesia. Our practice uses a combination of conventional surgery and leading-edge technology, including lasers, to deliver exceptional results personalized to your smile. And we use only proven American and European-made implants. Our seasoned team of two credentialed implant specialists and a credentialed laser and cosmetic specialist can handle even the most complicated situations. Our approach to ensuring lifelong dental implants is to make sure there is enough healthy bone and soft tissue to anchor your implant securely. Over the years our team has placed thousands of implants safely and precisely with an impressive greater than 98% success rate. 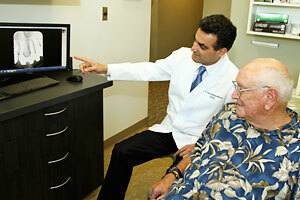 Your first step is a Free Consultation so we can evaluate your situation. One of our dental implant specialists—Dr. Messerkhani or Dr. Henriod—will conduct a comprehensive consultation in which they will get the basic information needed to formulate a treatment plan with several options, and to discuss the patient’s goals and answer any questions.